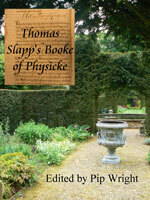 At some time in the early eighteenth century, a remarkable handwritten book was produced by a Norfolk man, Thomas Slapp, or one of his family. Containing a mixture of herbal remedies and recipes for wines & preserves, the book lists a wide range of ingredients from around the world, as well as wild flowers still common in the countryside today. Faithfully transcribed and researched, here are those pages, presented for a modern audience. Enjoy reading this book, but whatever you do, don’t try these at home! ISBN 978-0-9548298-7-2 This is now "out of print"